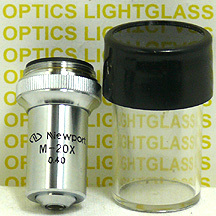 The Newport M-20 Microscope Objective Lenses are rated for 20 power at 160mm. With a numerical aperture of 0.40, and a 1.7mm working distance, these objectives are used as input lenses in collimating applications. Clear aperture is 6.0mm. The optical elements have a MgF2 anti-reflection coating optimized for the visible spectrum.